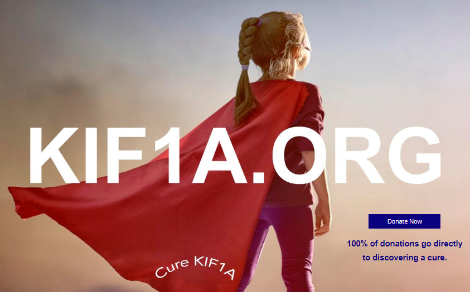 Our mission is to connect families and support research leading to treatment for people affected by KIF1A Associated Neurological Disorder. KIF1A is a molecular motor protein vital to brain function. Mutations in KIF1A cause a neurodegenerative disorder with a progressive course. The disease is associated with cognitive impairment, cerebellar atrophy, ataxia, spastic paraplegia, optic nerve atrophy and epilepsy. KIF1A-related disorder is a new disease, and research is rapidly underway to discover treatment. Every day we are closer to understanding KIF1A and how brain function is disrupted by mutations in the gene. Accelerating this research will lead to the development of medicine. Time is as much our enemy as nature. We urgently need your support to save the lives of children affected by KIF1A. Our goal is clear: to immediately find treatment for every child with KIF1A Associated Neurological Disorder.